Bellini: Orpheus, at the Natl. Gallery, Washington. Cowley's Plantarum epigraph is an ironic echo of Orpheus in Ovid's Metamorphoses 10.397: "I have a cure made up of herbs and verse." Bellini: The Feast of the Gods, at the Natl. Gallery, Washington. Both the Orpheus and a Feast of the Gods hung in Charles I's Whitehall (F. R. Shapley, Catalogue of the Italian Paintings [Washington, 1979] 1.46-48). 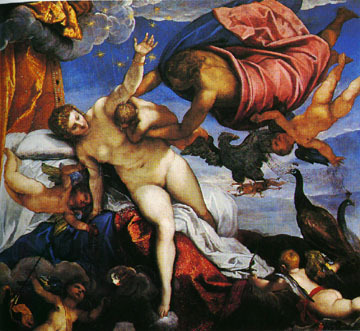 Some Labors of Hercules (ancient scenes with additional Web-links) Tintoretto: Origin of the Milky Way, National Gallery, London (see online discussion and additional images); the virtual painting forms part of a Swarthmore Web-gallery devoted to Hercules.